What is nesting in your hair???? The other day a close friend of mine, told me ” You never worry about anything” This totally took me off guard because this is not at all the way I see myself. I see myself as a person who battles everyday the thoughts that come through my mind. I remember back in the late 80’s when I refused to leave my house or answer the phone for weeks on end. It was during that time that the following scriptures became real to me. It was at that time,after a period of self pity and anxiety, I had to pick myself up for the sake of my family and hold on to all that I knew was true, and that was God’s word. You see man will fail you, your family will fail you, your finances will fail you, your friends will fail you, but God will NEVER fail you. It was then God became real to me and showed Himself to me in His word that I found these scriptures (along with others) that helped me pull myself up from the pit I was laying in and move forward in life. I hope you enjoy! 2Cor 10:3-5 NKJV For though we walk in the flesh, we do not war according to the flesh. 4 For the weapons of our warfare are not carnal but mighty in God for pulling down strongholds,5 casting down arguments and every high thing that exalts itself against the knowledge of God, bringing every thought into captivity to the obedience of Christ. So many times we forget that it takes an intentional effort to take captive the negative thoughts that come through our minds and then intentionally replacing those thoughts with positive scripture. 2Cor 10:3 says ” For though we walk in the flesh, we do not war according to the flesh.” I believe the mind is where the devil likes to play his games with us. Dropping negative thoughts in our minds, that unless we take captive we begin to feed on. Thus, allowing to grow into something that God never intended us to think.Then we act out what we think, which usually turns out to be a negative experience. So when we fight this battle of the mind- we must fight it spiritually with the word of God. In vs 4 where it says “For the weapons of our warfare are not carnal but mighty in God for pulling down strongholds,” The Word of God is a sword of the spirit in our spiritual armor. But how many times have we went to battle without our sword. Would the famous Spartans ever do that NO! No warrior ever leaves his sword behind when he goes to battle, but yet there is days that we as Christ Followers will go all day or even weeks, without picking up His word. That is why, you will find all around my house little strips of paper with scriptures printed on them, So everywhere I look I see a promise of God’s. So when those negative thoughts pass through my mind they can be replaced with ” the truth”. Verse 5 says “casting down arguments and every high thing that exalts itself against the knowledge of God, bringing every thought into captivity to the obedience of Christ,” when I hear that verse I see in my minds eye, someone literally taking their hand and pulling the negative thought out of their mind. Then throwing it as far away as they can throw it! We see in that verse, Casting down arguments, and every high thing that exalts itself against the knowledge of God. That phrase that says “exalts itself against the knowledge of God”. So to know what exalts itself against the knowledge of God we need to know what the knowledge of God is right? Well, I know that God says “Every good and perfect gift comes from above, I know that God says the steps of a righteous person are order of God.” So what I have to know, is when a thought comes through my head before I dwell on it, it must line up with what Gods word says or it must be cast out! 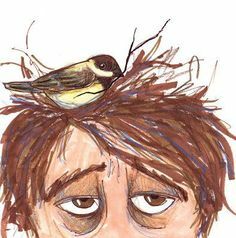 It is like my daddy use to tell me ” You can’t stop a bird from flying over your head, but you can stop it from making a nest in your hair”. So perhaps the outside persona that people see of me, is simple that, I choose what is nesting in my hair (i .e. head, thought life) and I choose LIFE! I choose to focus on the promises God has given me, instead of the faults and disappointments that this life has to offer. The question is, what is nesting in your hair? ?